Crush or chop the nuts into small pieces or large crumbs, add the sugar and cinnamon and mix thoroughly. Cut your filo pastry sheets to fit a 9inch square tin. Lay a sheet in the the tin, brush with melted butter and repeat with seven or eight more sheets. Add a thin layer of the nut mixture and then cover with two or three more sheets of buttered filo sheets. 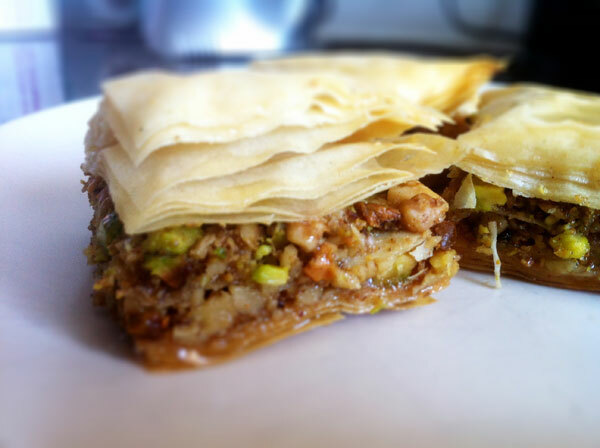 Add another layer of nuts and finish with another seven or eight layers of buttered filo. Cut into 16 even squares before popping into the oven for 30-35 mins. Mix all the syrup ingredients in a pan and bring to the boil. Simmer for seven to eight mins until it starts to thicken, then remove from the heat and allow to cool slightly before spooning over the Baklava while it is still warm.